White balancing is that funny thing your camcorder does sometimes that make your videos look too blue or too orange. Digital still cameras are also susceptible to this problem. Our eyes are not as sensitive to this phenomenon. In fact, if it weren't for video cameras, I wouldn't be writing about it. In general, anything that emits light has what is called color temperature, which is expressed in units of the Kelvin (K) scale. As you recall from chemistry class, zero K is considered the theoretically absolute lowest temperature, unlike the Celsius or Fahrenheit scale where there may be a below zero temperature value. And, people, the unit is Kelvins--not degrees Kelvins, or Kelvin degrees. Moving on . . .
To give you an idea, sunlight has a color temperature of approximately 5600 K. Incandescent lights, about 3000-3200 K.
What is considered "pure white" in the video world? 6500 K. Anything below that will have an orange-light brown tint, and is considered "warm". 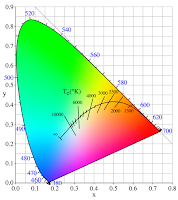 Light above 6500 K from a television will have bluish tint, considered "cool". "But, Ted," you ask, "how can I improve the quality of my videos so they don't look too blue or too orange? Help me, Ted. You're my only hope." Well, the automatic white balance control in video cameras usually can do an acceptable job as long as the lighting condition stays within a small range of color temperature. In other words, let's say if you're in a room that is all lit by incandescent lights, the camera should adjust its white balance correctly. Where things get problematic is when you mix light sources of different color temperature, for example, a room with open windows but also has lamps with incandescent light bulbs--a videographer's nightmare. The camera gets confused and does not adjust properly, resulting in the video often appearing too blue. Another example is when you move from inside shooting to outdoor shooting. Even moving from a sunlight area outside to a shaded area, like under a tree, will shift in white balance. Prior to shooting, completely zoom in on a white sheet paper or white wall in the area where you are shooting. Note that camcorders typically have a manual white balance adjustments, but on consumer units they are usually buried under layers of menus. In professional videography, white balance cards are often used. In worst case, some video editing software, like Final Cut Pro, Final Cut Express, Adobe Premiere Elements, will do color correction. Color correction is in fact considered part of the workflow among professional video editors.